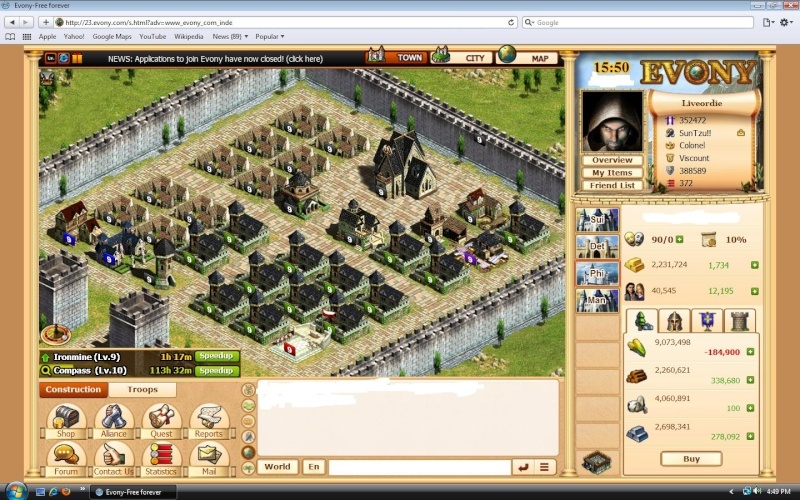 This is an image of the resource fields with a Level 9 Town Hall. Start off building 9 cottages. Sending resources from another town will really help this process. Get them all to level 2 asap. After doing this, go to the city view, and start building the resources. You will need 1 level 2 Quarry for the time, so put that in first, followed by iron mines and sawmills. Make sure to stay half and half on these, ending up with 1 more sawmill if you only have a level 9 town hall. After upgrading these with the speedups, you will go back into the town view, and you will start constructing all of the 1's on the list attached, as well as the barracks attached in the list. Make sure to also add a level 5 farm. This is needed for the stable, and the stable is needed for a relief station. After the relief station gets to level 9(stable must also be level 9) you can remove the stable from this town. 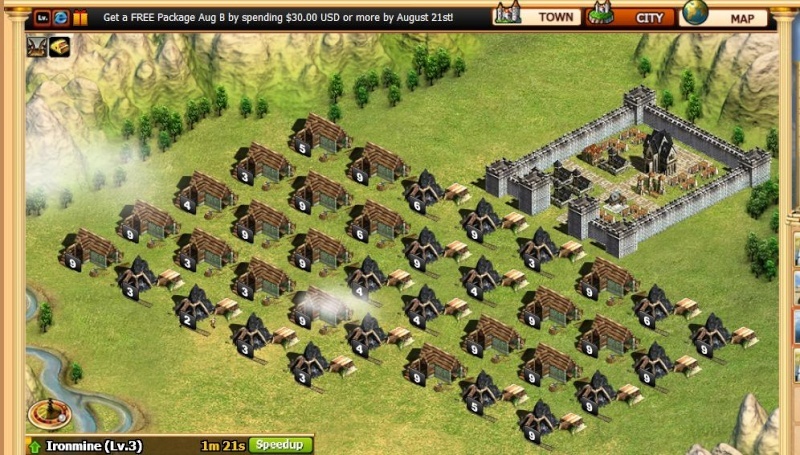 When you get the walls up to level 9, you are going to demolish 3 things in the town. The workshop, the forge, and the 1 level 2 quarry that you put in. 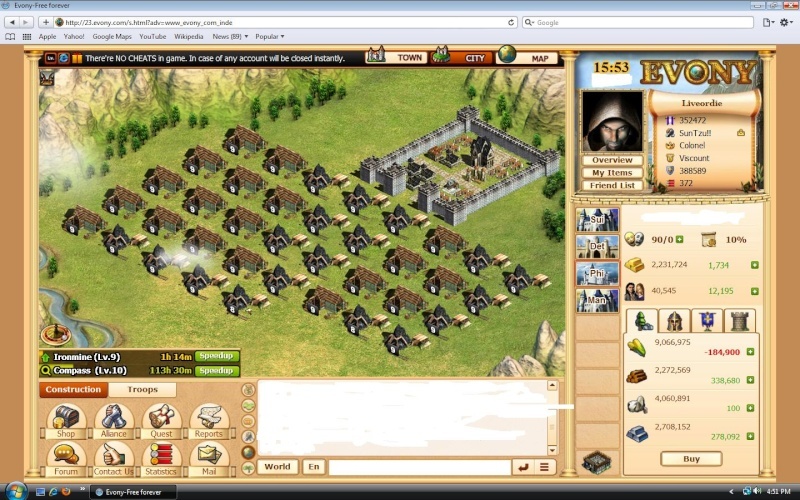 You will put barracks in the town, and a sawmill or iron mine in place of the Quarry. Once you reach level 9 on the Feasting Hall, you will demolish the inn, and put in another barracks in it's place. After all of this is finished, you will start upgrading all of the barracks up to level 9. For starting off level 4 barracks work. After all, this is an archer production town right? Good luck to all. Any questions can be directed to me via game, or posting here. Picture of a finished inside will be posted soon. Stay tuned. You only need a level 1 stable for a level 9 relief station. You only need a level 9 stable for HBR, which you might already have in another city. You do not have to have a level 9 relief station, you only need a level 8.